So My Neighbor Totoro is a Studio Ghibli film from 1988, written by Hayao Miyazaki. It's the kind of loosely plotted, visually engaging, wonder-ful little film that Miyazaki was known for. The film follows a family moving into a new house in the late 1950s or so in rural Japan. Satsuki and Mei, two little girls, are moving with their father to a house in the country that is close to where their mother is recovering from a long-term illness. The girls clearly miss their mother, but they are close to each other and their father is loving and despite their problems it's clearly a happy family. 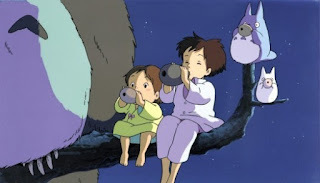 As the girls explore their new home, the younger sister, Mei, discovers that the world of their house is actually full of kind spirits, particularly one large forest spirit named Totoro. The spirits live in the forest and are its guardians. As the girls interact with these spirits, who cannot be seen by adults, they are taken under the spirits' protection. And that's a good thing, because when Mei and Satsuki get some bad news about their mother, Mei runs off to find the hospital on her own. 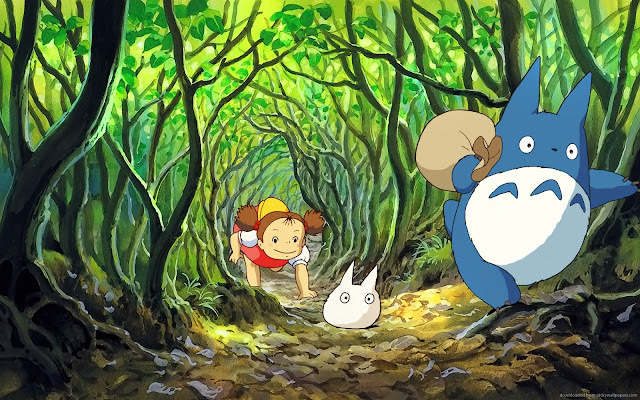 She gets lost in the woods, and it's up to Satsuki to ask Totoro for help so that she can find Mei. That's it. That's basically the entire film. Made up more of moments and vignettes than any cohesive story, My Neighbor Totoro is a comforting warm bath of a movie, the kind of thing you can watch late at night and know you'll have really lovely dreams. If, that is, you don't actually google the movie and end up having horrific nightmares about the awful backstory the film very well might have. Ugh. The basic story here is that while My Neighbor Totoro seems like a cute little movie with nothing much to say about the world or life or anything beyond the peaceful feeling of summer in the countryside, it's actually an awful fairytale retelling of a brutal kidnapping and murder that occurred in Japan in the 1960s. The evidence is all circumstantial, but it does pile up. Chief among the arguments for this theory is that the murder occurred in the Sayama Hills, where the film also occurs, involved two sisters, and happened in the month of May - both the girls names in the movie mean or sound like May. There's also little bits and pieces that seem to support this in the film itself, like when the cat-bus is asked to find Mei and flips its destination card to read "GRAVEYARD" before saying "MEI". Or when the villagers find a sandal that looks suspiciously like Mei's in a local pond, and while Satsuki does deny it's her sister's, it's easy to think she might have been wrong. And, most damning of all, the deeply baffling ending of the film, which is just confusing no matter what you think the movie is actually about. 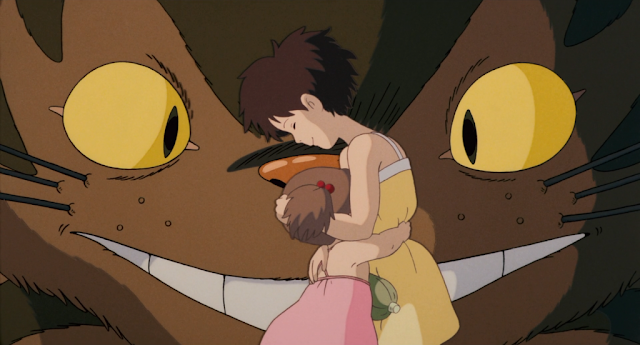 So My Neighbor Totoro is a sweet and soft movie about two little girls and the cuddly forest spirits who protect them, but also maybe a fairytale retelling of a horrific tragedy. I guess what I'm asking here is, even though the idea of it being this sad story clenches at the pit of my stomach, why do I kind of want it to be true? 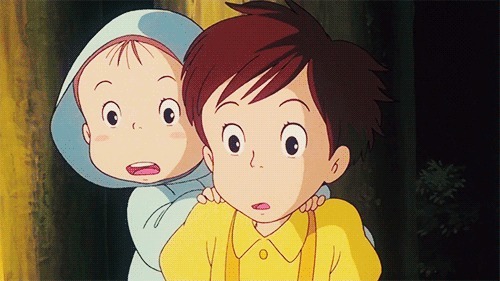 Why do I kind of want My Neighbor Totoro to be about murder instead of just cute kids and cute sprites? I really can't say, but I do think there's something here. We as humans are invariably fascinated by the depths of darkness that our human psyches seem capable of producing. It's why True Crime is its own booming genre, why Serial is such a popular podcast, and why I used to sneak over to the neighbor's house when I was in middle school so I could watch Unsolved Mysteries. We love dark theories that seem to make "so much sense" because we all seem to believe that if you scratch the surface of anything sufficiently cute and lovely, you'll find horrifying darkness and a pit of despair. And for all that I am alarmingly convinced by the evidence that My Neighbor Totoro really is a sad story, I think this is a really distressing trend. On the other hand, I also think it's worrisome when we push back against this kind of thinking and yell things like, "Can't you just leave it alone?" and "Movies for children don't need to be that deep!" I feel both of these sides at once: I want the cute thing to stay cute, but I also want to recognize that children's media, along with all media, can and should be subject to deeper interpretations. So what's a girl to do? I suppose the first step is to appreciate My Neighbor Totoro for more than just the creepy conspiracy aspects of it. It is a lovely story about two sisters who have a fantastic relationship. Despite arguing at one very stressful point of the movie, the two girls get on a hell of a lot better than my sister and I did, despite our being about the same age difference. They play together happily in this house, adjust well and quickly to their new surroundings, and are generally the kind of pleasant, helpful, and kind children you want kids to turn out to be. Furthermore, their relationship with their father is healthy and strong. 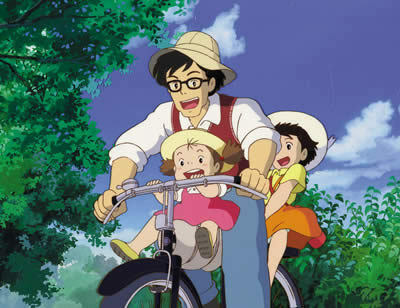 While he's not the most adept at temporary single-parenting - early in the movie he oversleeps and forgets to make lunches for the girls and later he loses track of Mei while she's playing the garden - the girls' father is the kind of parent who responds to his children's stories about magical forest spirits with utter seriousness and calm belief. He never suggests they're making these stories up or does anything but respond reasonably and with good humor. When the girls get all dirty playing with soot-sprites in the attic, he eagerly asks a neighbor if the house is haunted. 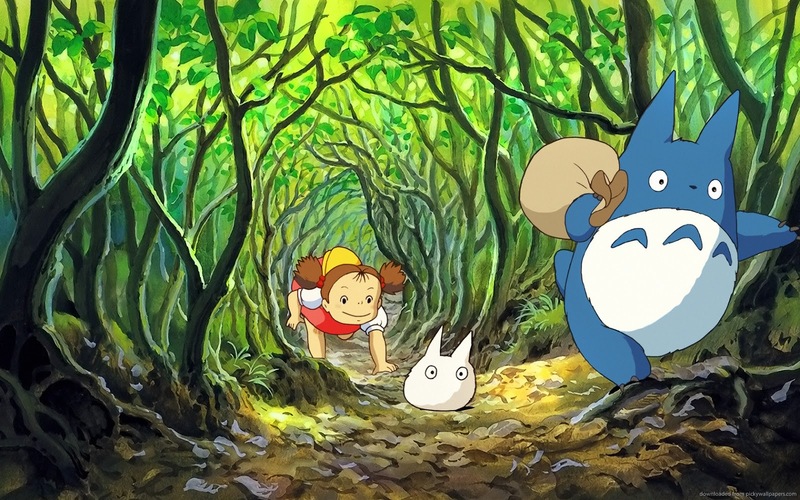 When Mei claims she ran into a tunnel in the woods and met a giant creature named Totoro, he suggests that Totoro must be a forest spirit and takes them all to greet the forest spirits and ask for their protection. When there's a storm and the girls are scared, he teaches them to laugh so that they're not scared anymore. He's a good dad, and I love that the movie never feels the need to diminish that in order to tell a "more interesting story". I mean, contrast this with nearly every American animated children's film - the parents are inevitably hostile to the children's imaginings. They never play along or take it seriously. It's always the parents who are an obstacle to the kids' playtime. 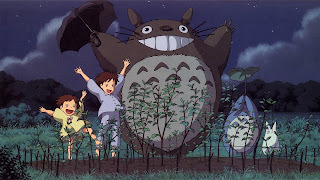 So I like that My Neighbor Totoro gives us a parental figure who has no problem with his daughters playing with forest spirits in the woods and doesn't even mind when his umbrella goes missing because they "gave it to Totoro". I could do with more dads like him in our media landscape. There are so many good things to praise about this movie. There's how the film depicts the girls dealing with their mother's long-term illness. While both Satsuki and Mei are thoughtful and accepting of the fact that their mother isn't at home with them, they're also saddened by this. The main conflict of the film comes when their mother is supposed to come home for a weekend but gets a cold and can't come. In a movie of utter sweetness, this undercutting sadness gives us an emotional context for the rest of what is happening and shows us how life both does and does not go on when a loved one is taken from us. Let's see - what else? The movie passes the Bechdel Test immediately and consistently, to the point that I'm pretty sure it fails the reverse-Bechdel Test. The girls are both adventurous and fun but different enough from each other as to feel like compelling characters in their own rights. It's a lovely film to watch and the animation is clearly rendered with great skill. Totoro is cute as hell and made to be a plushie. There's a lot to love here. I guess what bothers me most about the potential dark history of the movie, then, is that it overshadows all of this other loveliness. Yes, it's entirely possible and even kind of likely that the animators meant to reference the Sayama incident in My Neighbor Totoro. Perhaps this movie was meant as a coping mechanism, a way of reframing the horrific history of a place into a story that gives a happy ending the girls in the real world didn't have. But this history shouldn't overshadow all the wonderful things that explicitly are in the movie. Even if this easter egg is totally true and intentional, it goes against the point of the movie to focus on it. My Neighbor Totoro is about friendship and familial love and protection. It's about how these two girls are kind and sweet to the forest spirits and receive protection and guidance in return. It's a cute adventure, and to let ourselves be distracted from this is to do the film and ourselves a disservice. Yes, there is value in seeking deeper meaning. But there's also value in letting cute things be cute without complication. The challenge is to let all of this exist in your mind at once, to admit the horrifying nature of human brutality without letting it taint the things that really are good and beautiful and pure. That's the challenge of being human, and I suppose I should be grateful to My Neighbor Totoro for bringing it up with such clarity. The world we live in is dark and scary and we do need coping mechanisms to deal with that. The key is not to lose track of what's good.